At Folio West, we allow 2 pets per apartment, with no weight limit. Yes, we have a monthly Pet Rent of $20 per pet and a one-time Pet Fee of $350 (non-refundable) per pet. No Deposit. All visitors coming to tour Folio West will need to provide us with a valid government issued photo ID such as a Driver's License, Passport, State ID or Visa. - Security Deposits are $200 for 1x1, $300 for 2x2, and $400 for 3x3 bedroom apartments. The Security Deposit amounts listed here are based on approval; conditions may apply. All deposits are refundable after move out but may be subject to charges for damages found during the post move out inspection process performed by the onsite team. Yes, you can. In the event that you do in fact have to break your lease, we will require termination fees as stated in your lease contract. If applicable, you will receive your renewal options 90 days prior to your lease expiring. These options may include rates for month to month. Residents pay for their own utilities. You will be billed directly for Water, Sewer, Valet Trash, Pest Control, Common Area Maintenance, and Parking. Valet Trash is an additional fee of $30, Pest Control at $5, Common Area Maintenance at $10, and Parking at $10 that is added onto your monthly rent. Lease terms are 12 months to 15 months based on availability. Short term leases starting at six months are offered based on availability. You are required to have and provide proof of renter's insurance prior to move in. The minimum required personal liability amount is $100,000; from there you may add on any additional coverages that you feel you may need or want. Folio West is required to be listed as an additional interested party on your renter's insurance coverage. You can email, call the office, or use your resident portal to report a needed repair which goes directly to our on-site staff. Rent payments will be due on the first of each month and considered late on the fourth. Yes, you may pay your rent through the resident portal after hours, please note that payments made by check or money order must be made during office hours as we do not have a rent drop box. Any person not on the lease who is staying in the apartment for longer than 7 consecutive days or 14 days within one month will need to be screened and approved to reside in the apartment. Yes, we will need to be notified and if they will be with you for longer than 7 consecutive days or 14 days within a one month period. We will also need to add them as occupants to your lease. We do not permit the use of satellite dishes on property. Yes, AT&T U-verse provides cable, phone, and internet services to all of our residents. Yes, Folio West offers a state of the art Fitness Center open 24 hours with both weight and cardio equipment. Folio West offers our residents a large resort style pool featuring cabanas and a covered lounge area. Yes, we offer onsite recycling through Valet Waste. Gas grills are not permitted to be used or stored on property; however, for the convenience of our residents, Folio West features a beautiful outdoor kitchen and grill area located by the outdoor lounge and pool. We do not sign for resident packages; however, we will hold packages in the office for pick up. For packages needing signature, we recommend that you schedule delivery when you are home or as an alternative, schedule a delivery to your work location, if available. DIRECTIONS: Via Sam Houston Tollway N: Head north toward Sam Houston Tollway N. Merge onto Sam Houston Tollway N. Take the exit toward Westheimer Rd. Merge onto W Sam Houston Pkwy S. Use the 2nd from the left lane to turn left onto Westheimer Rd. Turn right onto CityWest Blvd. Folio West will be on your right. Via I-10 and Sam Houston Tollway S: Continue on I-10, take Sam Houston Tollway S to W Sam Houston Pkwy S. Take the exit toward Westheimer Rd/Richmond Ave from Sam Houston Tollway S. Continue on W Sam Houston Pkwy S to CityWest Blvd. Folio West will be on your right. For After Hour Emergenices please call 713-780-2525 and follow the prompts for emergency maintenance service. 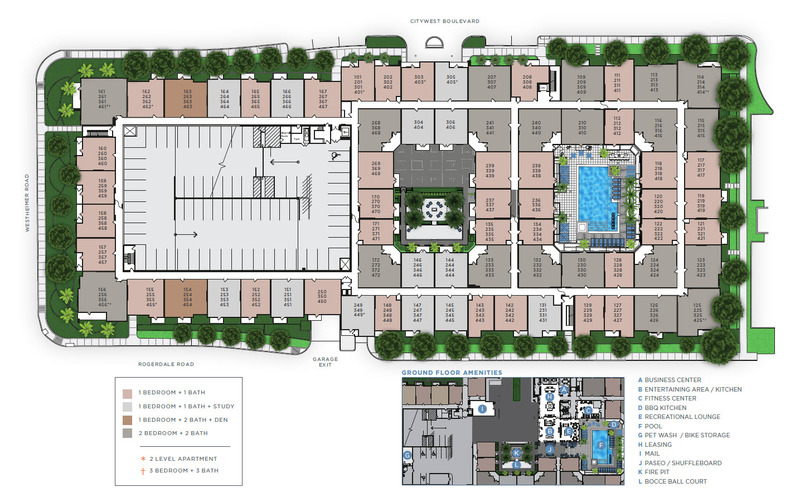 Folio West is bringing brand new luxury apartment living to West Houston, TX. We will welcome you home to ultimate comfort with elegant wood flooring, spacious floor plans, and high ceilings at our one, two, and three bedroom Westchase apartments. Relax around our fire pit and water feature in the courtyard, or spend a few hours in our entertainment room with media wall, billiards, and gaming tables. Enjoy our refreshing pool, spa, and cabanas and have fun cooking in the outdoor kitchen at our new apartments in West Houston, TX. At Folio West, you will never be far from work or entertainment! Our apartments in the Briar Forest area of Houston are just moments from excellent shopping at CityCentre Plaza, and conveniently located along West Sam Houston Parkway, making any commute in the Houston area that much easier. Folio West apartments in Westchase Houston provide you with the finest apartment living in the area.